It's cold AND windy here in Serre Che. The cannons are working hard to prepare the snow for the pre-season opening on 7th December but most of the snow is being blown every which way but on the pistes by the brisk NW breeze. 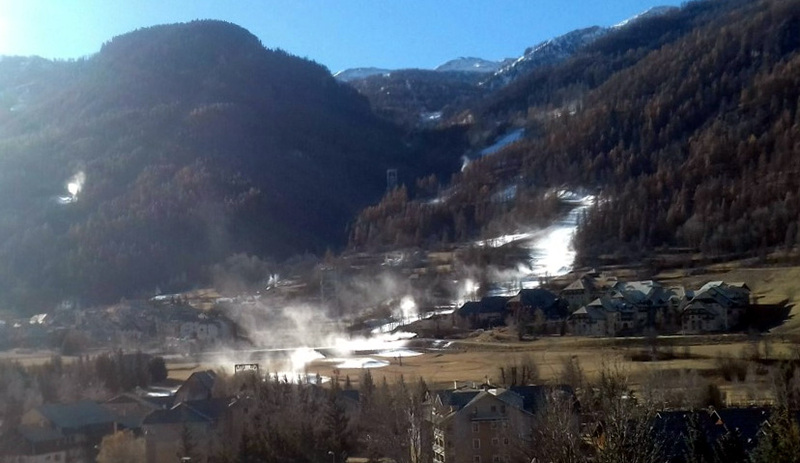 Not only is there no snow to ski on (except in Montgenevre which is open this weekend and will be mobbed by families) but it's pretty brutal weather for spending long outdoors . So the Rando Chiens have raced up and down the hill chasing their ball for half an hour, I've done a quick face-chilling running circuit and Gav's been turbo training in the garage. Okay so I had a touch of FOMO on Tuesday, not fear of missing out on amazing powder but missing just being in the snow and putting skis on. Which is why I didn't hesitate to agree to going today for what would be my first ski tour of the season. And the Rando Chiens'. 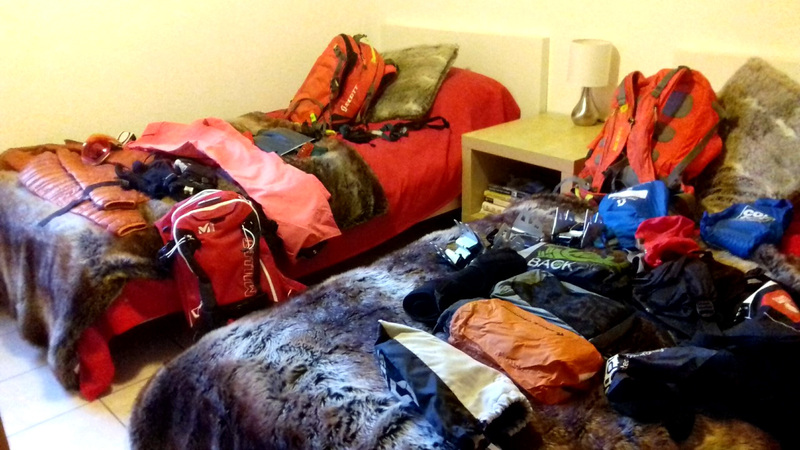 Because we were going to be touring up the (closed) pistes of Montgenevre and there was 30cm of snow max, we could leave all the avy gear behind, which certainly lightened the load. We left just after 9am with the frost crunching underfoot and were all set for touring just before 10am in the car park on the Italian side, just beyond the border at Montgenevre. 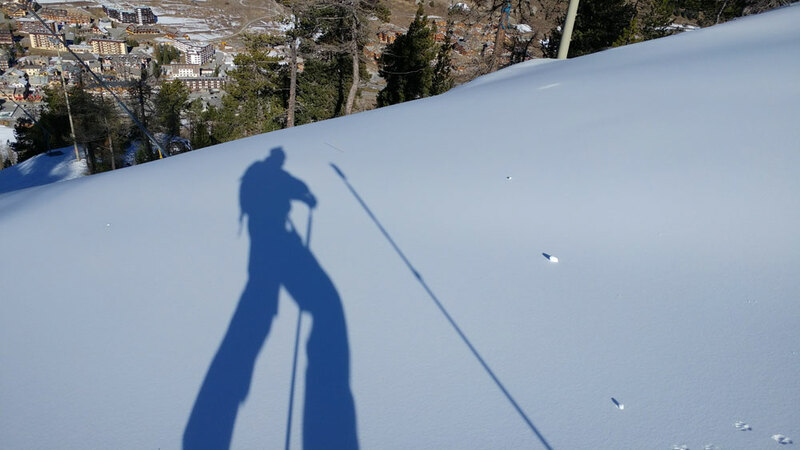 We were the first to hit Manchester (the fresh groomed corduroy) touring up but met quite a few other ski tourers and Ski Mo speedsters in Lycra who had hiked up from the French side to the top of the Gondrans chair. Then it was a chilled ski down in 2cms of fresh pow (snow cannoned) and more untracked Manchester. Okay so it wasn't knee-high off piste powder or even backcountry spring snow but it WAS a whole freshly cannoned and pisted ski resort practically to ourselves. After a total tour of 12km and 800m vertical we were back in Montgenevre for burgers and chips shared with the Rando Chiens in one of the only bars open in town..
We've actually been out in Serre Chevalier for nigh on a week now and the weather has been most pleasant, in fact almost spring like for a magic couple of hours around mid-day. So much so that I've been out on the bike most days. 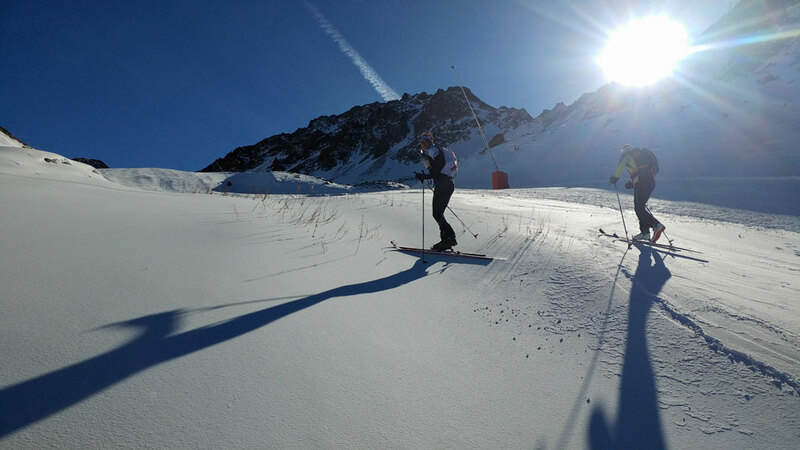 On Monday, I cycled up to Montgenevre where some of the lifts have opened but only for the weekend and had a chat with a couple of ski tourers who said conditions were 'not too bad'. So Tuesday I hooked up with a mate and we decided to go and stretch the legs. What was quite surprising was the number of people skinning up, and all types, from elderly mature Italians through to uber-tech Ski Mo racers. Off piste was a NO NO though, sure, higher up and on the right aspect some spring snow could be found, but this was really about just getting out on the skis and maybe having a reasonable ski back down. We ended up skinning to the Col Vert / Grand Charvia, some 800m. It was a good work out to try and find the ski legs and test the pressure points with the boots, etc. We'll be heading back Thursday for some more along with Les Rando Chiens!